Enjoy organic riazhenka as a snack or soothing bedtime drink, poured over fruit or granola, whizzed into smoothies, or used instead of butter and cream for healthier cooking and baking. Winner of the Dairy Innovations Awards 2013, Bio-tiful Dairy is one of the few specialists in the UK to produce top-quality organic cultured milk drinks. What’s more, the company shares many of our values, from its passion for using only the best quality organic ingredients, to its commitment to recyclable packaging. Why is riazhenka so good for you? Riazhenka has been a popular health drink in Russia and Eastern Europe for centuries. It’s revered there for its anti-ageing and immune enhancing properties. Now we know that riazhenka is simply packed with nutrients: it’s rich in amino acids, enzymes, calcium, phosphorus, magnesium and B vitamins, as well as billions of gut-friendly bacteria. 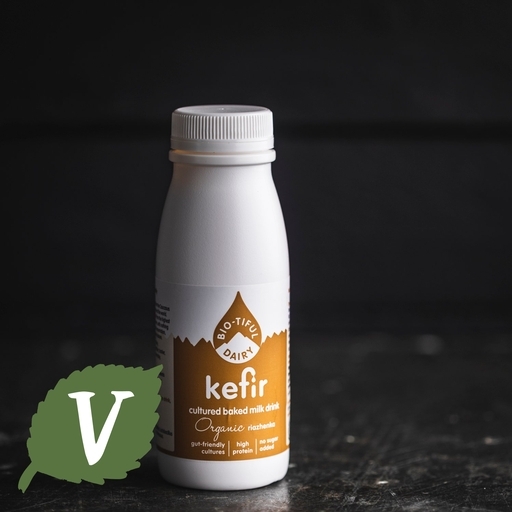 Whole pasteurised homogenised cow's milk fermented with live riazhenka cultures* (Bifidobacterium*, Lactobacillus acidophilus*, Lactobacillus plantarum*, Lactobacillus casei*, Lactobacillus rhamnosus*).